Growing up in the West of Ireland fishing for pike was one of my favourite pastimes. On this page I am going to talk you through some methods for fishing for pike in Ireland, and I will also share some facts with you about pike fishing. My experience has shown me that certain methods work better on different locations in Ireland. Fishing for pike, my favourite method is spinning. Spinning involves the repetitive casting of baits which imitate or simulate the movement of small fish, such as plugs, spoons and spinning lures such as a mepps. Different plugs and baits work best for each location, you will need to experiment. Fishing using a dead fish mounted on a specially designed spinning flight is also a spinning method. 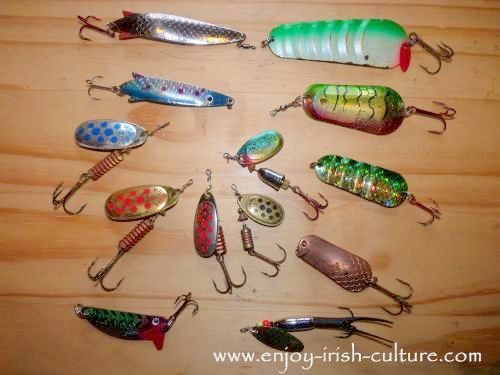 Here is a selection of my favorite plug baits.The roundish ones with the big lip are called 'Big s' baits. They are designed to dive deep when retrieved quickly allowing the angler to fish at different depths. They are hollow with a ball inside which rattles, sending out vibrations which are attractive to pike. The slimmer baits are made by 'Rapalla'. Some are designed to float on the surface, while others dive when retrieved. Pictured above are some effective spoons and spinners.They are designed to imitate the action of small fish. The slim long ones at the top left corner are called Toby's. The spoon baits on the left are the 'Atom'. They wobble in the water mimicking an injured fish convincingly. Some color combinations work better than others in different locations and weather conditions. A dull bait will work well when its sunny, while a shiny bait works better on an overcast day. I have caught more pike on these than any other bait. The other spotty baits are called blade spinners, usually referred to as a 'Mepps', after the company who invented them. They create excellent vibrations in the water as the blade spins upon retrieval, provoking a strike from the pike. Or try using a simple dead-bait method with a mackerel or a freshwater fish that form the bulk of a pike’s diet like a roach or a perch, for example. The larger pike (which are the females) usually prefer a well presented large dead-bait, as they like to conserve energy, while the smaller male “Jack” pike usually will chase after spinning baits. I prefer spinning because, I like to keep busy. Martin Connor with a 19 1/2 Pound catch from a lake near Castlebar, County Mayo. What a beauty. For a fisherman I’m not very patient, and a lot of the times I’ve spent dead baiting, I’ve been pre-occupied worrying if the bait became detached or if it was some place the pike couldn’t get at it. My friend Kevin, who is a Pike fishing ‘supremo’, and a far more patient man than me, tells me it’s worth the wait. He’s caught numerous pike using this method. One of his tricks is to place some polystyrene in the bait fish, which lifts it slightly off the bottom and allows it to bob enticingly in the current. I have caught a couple of pike over 15 lb spinning, but generally speaking the bigger pike fall to deadbait. Fly-fishing for pike has also become a popular method over the past few years, but I haven’t tried that myself. In recent times in Ireland, fishing for pike has become very popular, while in the past Irish anglers often mistakenly viewed this fish as a 'pest'. 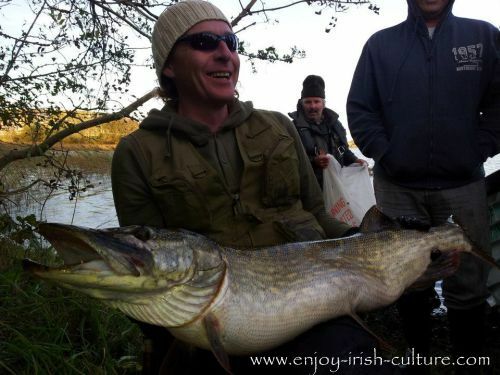 The Pike is the largest freshwater fish in Ireland, with some fish in excess of 40lb. Ireland's fishing locations for pike are well known to our European cousins who have long travelled here to sample exciting pike fishing. 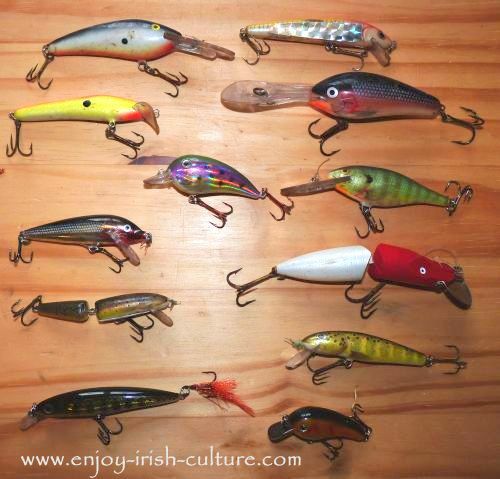 The pike has become the most sought after freshwater species throughout Europe and greater numbers of Irish anglers have become involved in pike angling. Most Anglers, conscious of preserving our healthy and valuable stocks, practice ‘catch and release’, taking great care to handle the fish gently before returning it to the water, relatively unharmed. There is no statutory close-season for pike in Ireland, so you can enjoy Pike fishing all year round. Pike spawn between March and May and this can be the best time to land a massive specimen. Pike are spread throughout most of Ireland, to a lesser extent in the south and southwest. They thrive in most conditions, from a town canal to massive water such as the Erne system. The official Irish rod-caught record for a pike is 42lb 12oz. There was however a previous record of 52lb caught in the 1920s, but it was removed from the records following more stringent criteria relating to the capturing and recording of specimen fish in Ireland. 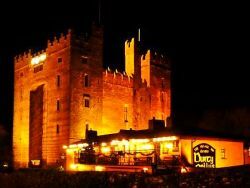 There are also tales of much larger pike caught down through the years, which include fish of 90 of a 92 lb reportedly landed on Lough Derg and on the river Shannon. For me, there’s no reason to doubt that fish of this size live in some of the bigger lakes. Hello there. Hope you enjoyed our article on pike fishing in Ireland? If you did, why not tell all your friends about our website so that they can enjoy it, too. We have some easy to use social options on the top left and at the very bottom of pages. Thanks so much for your support! Warmest regards from Colm and Susanna.